For the people in your brand’s audience, their flow of information pretty much starts and stops with their smartphone. Shocking, right? Stop me if you’ve heard this before, but a strong mobile presence is vital as vital for today’s brands as their social footprint and online identity. This year, Apple’s updates to iOS bring users, brands and marketers a large swathe of great opportunities to take engagement further, bring brand purpose to richer life and connect more meaningfully. Performance isn’t just a theme for Apple this year, it’s law. From major improvements to Siri to new, performant foundations for iOS and the Mac, we’re watching the device maker line things up for its next computing shift. iOS 12 is designed to get a performance to the tune of 2x boosts under load, which, between the lines, means older phones with older batteries. There’s also 70 percent faster camera opens and 40 percent faster app launches on iPhone 6 and iPhone 6 Plus devices. For some users, that takes their phone from feeling so slow it’s unusable on iOS 11 to, if not new, then like-new on iOS 12. With Apple committed to supporting devices as far back as 2013’s iPhone 5s, brands get more wiggle room on what their apps and services can do while also keeping the addressable number of users as wide as possible. Compare this approach to Android, where devices are lucky to get two years of software updates and the majority of users are still running software from 2015 or earlier and suddenly an iOS-only or iOS-first approach looks quite appealing. Your devices shouldn’t work against you. iOS 12 and enhancements to Siri make it easier to put your phone down. For being the first voice assistant on the market, Siri’s reputation has taken some hard knocks in the seven years since its debut. With new competition from Amazon’s Alexa and Google’s Assistant products, market, consumer and developer pressure has been levied on Apple to open Siri up. In 2016, iOS 10 saw the introduction of SiriKit, a developer framework that offered up eight distinct domains to make Siri useful for starting calls, transferring money, hailing a ride and sending messages. Now, developers and users alike can assign voice commands to actions they take across apps and services and even interact with content with a simple voice command. Better still, users can assign their own custom voice commands to these actions, making them accessible and memorable. Shortcuts don’t stop there, though. Brands and developers can now create their own custom Siri intents, adding new levels of flexibility to intents to support things like ordering food, displaying information, playing media, etc. And, Siri Shortcuts are supported across not only iOS, but also the Apple Watch and HomePod. Look, every brand is digital now. Brand managers, parent companies and marketers can quibble otherwise, but there’s no getting around it. Being truly digital means being able to command and control the flow of data, and the Shortcuts app does that in a way that in a super easy, super flexible way. Siri has meant so much more than a voice assistant since iOS 9—at least, it has inside Apple. Today, Siri represents a lot of the consumer-facing AI features, across iOS, watchOS and tvOS. And it means that users are able to build their own actions. That’s something that Amazon’s working at, but that is so much more powerful when you have an army of apps at your disposal on a phone vs a dozen, at best, skills active on your Echo. Some apps, especially social apps, get thirsty. Whether for growth hacking or engagement baiting, we’ve all been in a situation where an app on our device gets a little too chatty. With iOS 12, these offending apps are just a swipe away from being sent to notification purgatory thanks to the new new “Deliver Quietly” option. Instead of alerting you while you’re in the middle of something, apps with notifications set to deliver quietly go straight to notification center, bypassing the lock screen, so as not to disturb you. Should your brand be worried its notifications are about to never be seen again? Well, what if they were never turned on? Less savvy, less mobile-focused marketers would hear “no notifications” and abandon the tactic. Mobile’s so much more adept at offering value than any Facebook tactic, though. Sometimes, you just have to nudge users toward a feature. In iOS 12, for the first time, users can get a taste of what an app’s notifications look like before committing through provisional notifications. Like “Deliver Quietly,” these bypass the lock screen and appear in Notification Center. That means more opportunities for your user to discover what your app has to offer. Is this the place to necessarily be talking about your new discount? Maybe, if you’re adding significant value. Is this the place for your “Hey, your friends are posting content” notification? No. And let’s face it, that kind of notification is bad, has always been bad, and we should all feel bad about encouraging them. So with all that, are notifications doomed as far as marketers are concerned? Nah. In fact, in iOS 12, notifications can offer richer interaction. Since iOS 10, apps have been able to customize how notifications appear to include things like photo and video previews. Now with iOS 12, they can also add controls to the preview. So when your friend, partner, parent or boss posts that awesome vacation pic and you get a notification, you can give it a like on Instagram without even having to open the app. Apple’s leading the way in AR. Real AR. And it’s set iOS up to be the largest AR platform in under a year. It feels like brands are finally waking up to the opportunities augmented reality has to offer for them…and all they think about are, frankly, terrible Snapchat lenses. 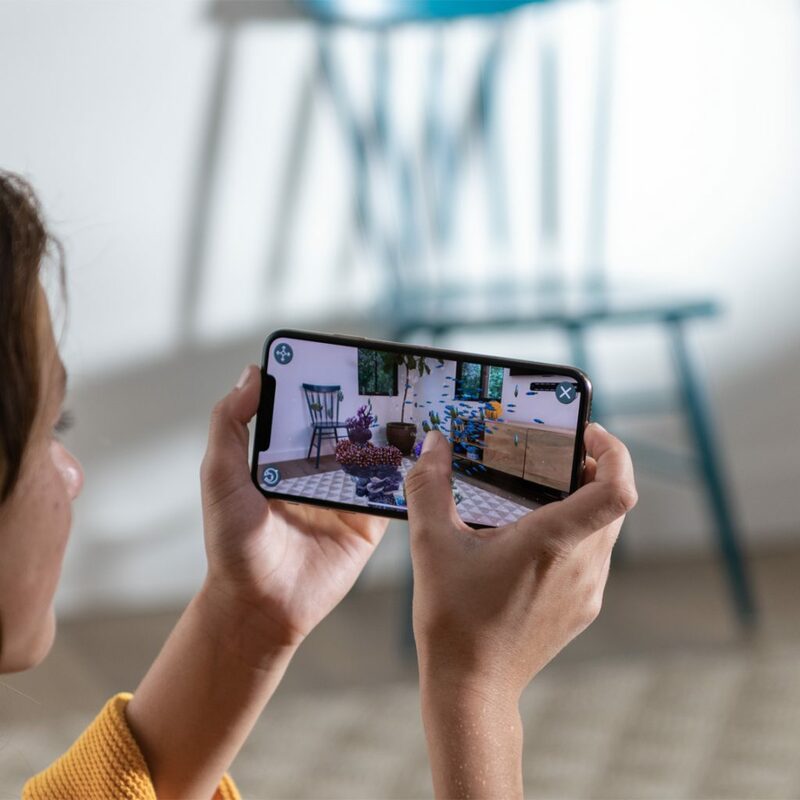 AR can be so much more powerful than that, though, and iOS 12’s updates to Apple’s ARKit framework make AR so much more accessible and give developers and brands so much more they can do than admittedly fun face effects. Shared Experiences. iOS 12 makes demoing and trying AR experiences easier by introducing shared experiences. Using a combination of Bluetooth and WiFi signals, devices can share the state data of the AR in front of them between one another, without having to round-trip to the cloud. That opens a lot of opportunities for games, but it also means that that medical students examining a patient’s case in AR can all be looking at the same thing, interacting with the same thing. Online shopping is great, but how many times have you actually wondered what that product would look like in your house? It’s called AR Quick Look, and it’s as simple as a brand creating product assets in USDZ, a file format designed by Pixar, Adobe and Apple that stores not only 3D files, but information about product scale and size. On any iOS device running iOS 12 or later, trying a product out is as simple as tapping an image. Don’t believe me? Try it for yourself here. No app required. Supporting AR Quick Look is a no brainer for a lot of brands, not just retailers. USDZ models can also contain light animation—though full interactivity will push you pretty firmly into app territory. Apple’s not kidding when they say that ARKit’s become the largest AR platform. In just over a year, it’s given new capabilities to developers on devices from the iPhone 6s and newer. Map a physical 3D space to set a perimeter for an AR experience. Persist objects. Imagine a campaign where an influencer leaves virtual objects for their fans to find. ARKit 2 makes that possible, not to mention creating things like virtual family notice boards. Track moving images in addition to static ones, meaning your experience can change as it gets closer and further away. Recognize 3D objects. Forget image tags, forget scanning a QR code. ARKit can be trained to know your product and react when it sees it. But Why Should a PR Shop Care? There are exactly two technologies in the pipeline that stand to actively disrupt the smartphone: Voice and AR. Is that saying that social’s going to go away? No. But neither voice nor AR is going to depend on a smartphone being front and center to matter. The brands and the platforms that want to win the next decade will win by stepping outside the walled garden of a social network. Yes, even Facebook. Whether it ends up being through a phone or through a set of glasses, the obvious place for brands to be thinking for the next decade is beyond the screen. Is Snapchat, Facebook or Instagram lenses a bad place to start? No. But it’s a bad place to get stuck. Are there challenges for brands looking to jump into AR? Sure. For one, PR and marketing professionals need to take a hard look at what their delivery timeline is (you shouldn’t be pitching an AR idea with less than a six month lead time, and that’s probably pushing it). And it’ll also face client pushback. While Google is working hard on ARCore, their AR software framework, the reality of a lot of Android development means it’s going to be several years more before we see widespread adoption on other smartphone platforms. But that’s no reason we can’t start with ARKit today, particularly when many clients see 4x as much engagement on iOS as they do on Android.